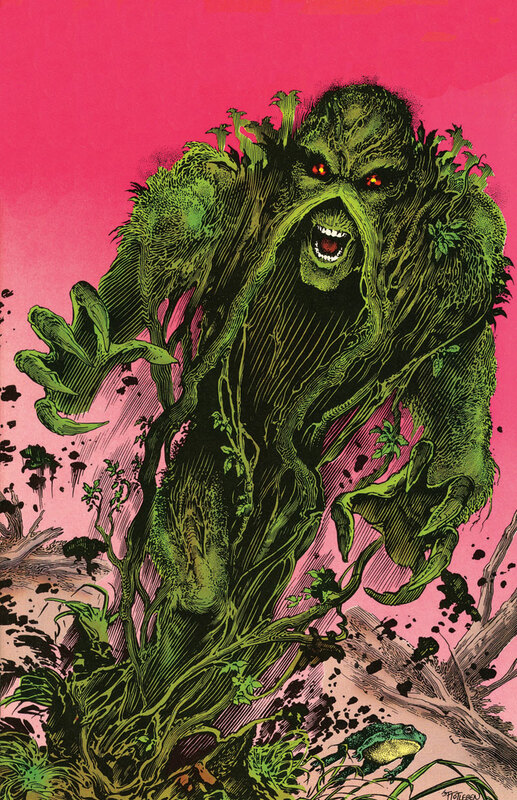 Sea anemones are not a real life version of Swamp Thing from DC Comics. Ok, maybe calling it the worst headline in the world is a little hyperbolic, but it is a terrible headline. I have seen this headline over and over again, phrased exactly the same way, indicating that many, many sites do not bother even attempting to write their own versions, but simply cut and paste from other sources. But that is not the problem I have with it. The headline is woefully incorrect, seriously misleading, and damages all the hard work educators have spent trying to get people to understand genetics and how it affects our evolutionary understanding. The people who wrote this headline should really have known better and the people who wrote the articles should certainly have known better. For an example of a well written article that really explains what the research says, yet has this horrid title to it, try here. The information in the article is excellent if one can get past the horribly misleading title. In many cases, the author of the article is not to blame because the headlines are written by completely different people, who don’t necessarily either read nor understand what the article really says. That is a serious problem because many people, if not most, only read the title, or if they read the article, only remember the spin imposed by the title. Thus, titles matter (for more information on the effects of headlines, try here, here, here, here, and here). The headline and many of the articles imply that a new study on the genetic code of the sea anemone revealed a mixture of animal and plant DNA. The research does not in fact say that. So I will attempt here to explain what it really DID say. To summarize, the genome of the sea anemone is very similar to other animals because it is, you know, an animal. However, there are certain key aspects of its gene regulation that are similar to plants. This is not as bizarre as it might sound though. 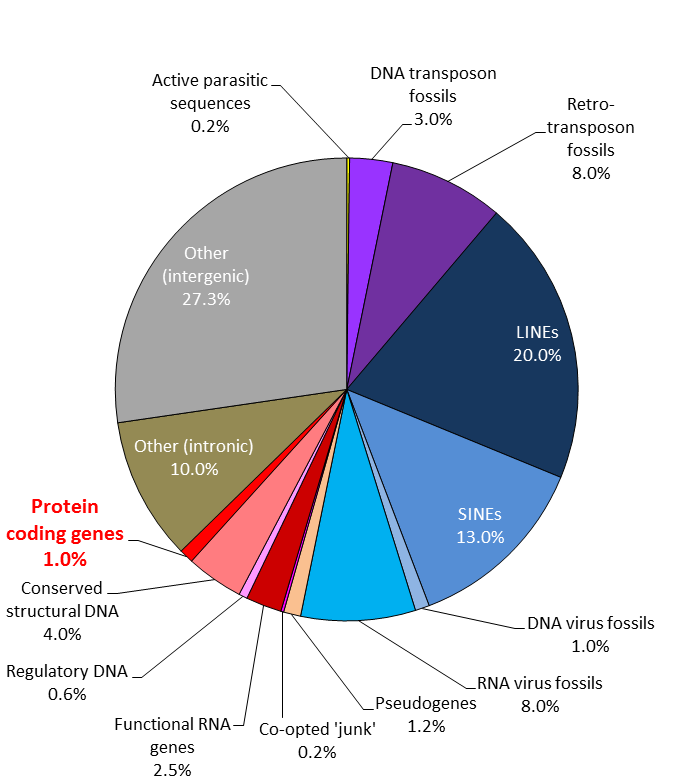 What’s in your genome? by Steve Cook. To begin with, let’s clarify what the article is referring to. Most of the time, when people talk about genetics, they are referring to the nucleic acid sequences, specifically Deoxyribonucleic Acid, or DNA, that code for genes. This is actually only a small part of the DNA. The rest is taken up with a variety of other things, including a variety of gene regulatory elements, junk DNA (broken genes, viral sequences, etc. ), and chromosome structural sequences. The genome, or total genetic sequence, collected into a set of chromosomes, can be thought of as a book. The text includes all the gene sequences, but most of it has been marked out and written over ( what is often referred to collectively as “junk DNA”). The table of contents, page numbers, chapter headings, introductory publishing information, and index would be the regulatory bits; and the spine, cover, pages themselves, and everything holding it all together would be the structural elements. All of these parts are included in the complete DNA sequence, along with various proteins like histones that help package all the DNA. Pretty much all of this DNA in the sea anemone, according to the study, is very similar to other animals, even vertebrates like us. The genes are similar, the regulatory sequences are similar, pretty much everything is similar. This is interesting because it speaks to the relative closeness of relationships between all animals. The genes used by sea anemones are simply variations of genes found within us. The regulatory sequences are variations of the same sequences we use. However, not everything is the same. 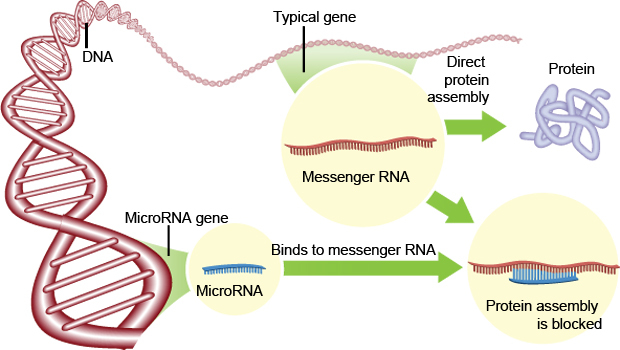 There are small sequences called micro-RNAs. Ribonucleic acid, more commonly just called RNA, is most commonly known as the molecules that help translate DNA gene sequences into working proteins. But that is not all they can do, Unlike DNA, RNA can do more than act as a codex of information. RNA can act as an enzyme at the same time. Enzymes are typically proteins that act on other proteins or on the DNA and RNA themselves. When micro-RNAs act on the DNA and RNA, they regulate expression of the genes, altering how much and what kind of proteins are created. 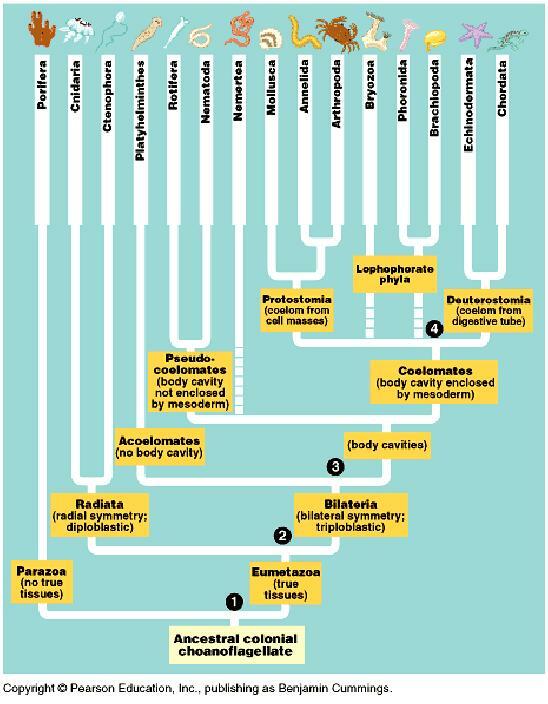 This is where sea anemones differ from other animals. The micro-RNA of sea anemones is more like plants than animals. It had always been supposed that plants and animals evolved their versions of micro-RNAs separately, because they use different sequences and use different molecular pathways. They act differently. For instance, in animals, micro-RNAs bind to multiple proteins and inhibit their functions. Plant micro-RNAs are much more specific and slice up the protein, they don’t just inhibit them. Thus, it may be that sea anemones are telling us that the system developed before plants and animals split off from the ancestral organisms from which both plants and animals evolved. Not only that, but that the original pattern was kept by plants and substantially altered in animals. The other part of this story that is not made clear is just what relationship sea anemones have with other animals, as well as plants for that matter, which in this case is fairly important. When looking at the early history of eukaryotic (with a nucleus containing DNA), multicellular animals, sea anemones are really, really early. Sea anemones are part of a group called cnidarians. Cnidarians, so named for cells called nematocysts, or stinging cells, also include what are generally called jellyfish, along with coral. On the tree of animal life, you can’t get much more primitive. The only animals thought to have evolved earlier than cnidarians are sponges and ctenophores, commonly known as comb jellies. They are so close to the base of the animal tree of life, one might say if they were lower, they would be only a step away from being fungi. Fungi, according to the genetic research, branched off from the animal lineage shortly after the split between animals and plants, which indicates just how closely related these early forms are. In addition to being really close to the the plant/animal split, there is one last thing to consider. Sea anemones, like coral, depend on a mutualistic symbiosis with green algae, which, obviously, are plants. The algae collect sunlight to make sugar and oxygen, which gets shared with the sea anemone. 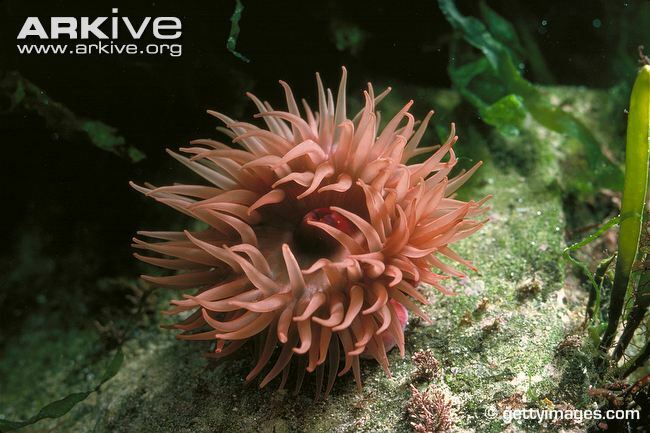 The sea anemone in turn provides the algae a secure home, guarded by venomous tentacles. This relationship is similar to the well-known symbiosis with clownfish (remember Finding Nemo? 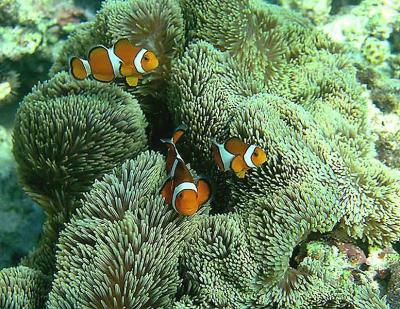 ), in which the clownfish gets protected from predators while providing food for the anemone. This is one case in which having messy tenants is actually a good thing. Now, considering that the anemone relies on algae for its survival, linked as it is metabolically to the algae, and evolutionarily is not that far from being a plant itself, is it any surprise then to find that some of its metabolic regulation uses a system seen in plants? Sea anemones are not half animal/ half plant. They are extremely primitive animals that have their metabolisms linked directly to a plant, unlike the indirect link that other animals have (eating plants or animals that eat plants is a strong, but indirect link, wouldn’t you say?). Sea anemones: not real plants, not even by half, they just play them on TV. By paleoaerie in Uncategorized on March 25, 2014 .